Running in cold weather isn't always fun. Runners have learned that wearing several layers of clothing offers the best protection. But getting dressed in layers of warm clothing inside a warm house often causes one to perspire. Starting a cold weather run with damp clothing means the runner will get cold?quickly! In cold or freezing temperatures, moisture is the skin's worst enemy. Moisture pulls heat away from the skin 23 times faster than air, and can reduce skin temperature so rapidly that wet feet feel painfully cold. Wet skin makes the feet much more susceptible not only to frostbite, but also to blisters. The Drymax Cold Weather Running Socks have a special Dual Layer Moisture Removal System. 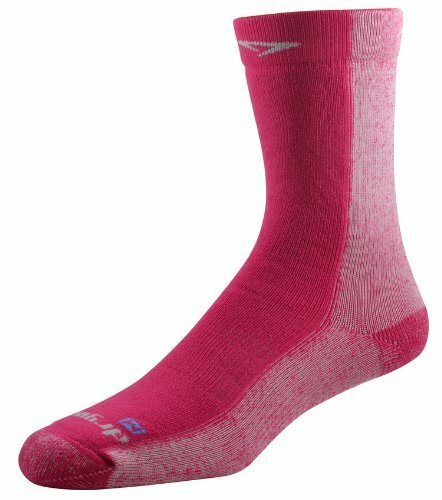 This system instantly moves moisture from the skin, through the inner Drymax layer to the outer absorbent layer.Cold Weather Running socks are knit with Hollow Core polyester fibers on the outside to increase the insulation factor. The Cold Weather Running Sock is a High Density protective padded sock. Dense padding is used as opposed to thick padding, as it protects feet without adversely affecting the fit of the shoes. Cold Weather Running Socks were designed for use in cold to cool conditions.Several features work together as an anti-blister system to actively prevent the formation of blisters: Exceptional 3D fit, five sock sizes, seamless insides, an instep-hugging arch band, and blisters normally caused by sweat or sweat vapor are prevented.The MicroZap® antimicrobial in the Drymax Fibers is a silver-zirconium phosphate ceramic ion-exchange resin. It fights odor-causing bacteria, helping keep socks odor free. MicroZap provides long term Active Odor Control.The special fibers used in the Drymax Socks have a comfortable springiness and do not get stiff, shrink or lose shape over time. They are designed to last a long time using the highest quality fibers, and abrasion resistant nylon fiber reinforcements in the normal wear areas.